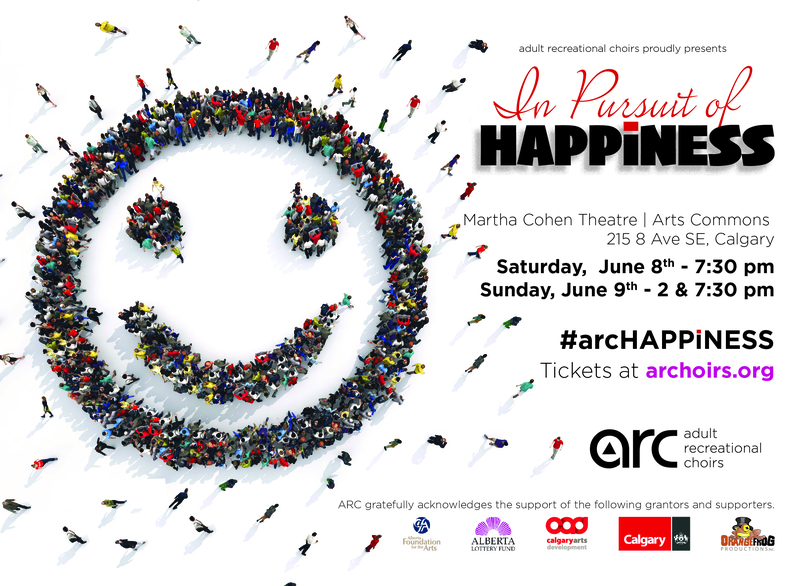 Tickets to the 2019 ARC Year-End Show, In Pursuit of HAPPiNESS, are now on sale! Forget your troubles and just get happy! The Adult Recreational Choirs (ARC) summon the positive forces in the universe to deliver a healthy dose of happiness for a world that could use a reason to smile. Tickets are for reserved seating, including our Premier Circle for the best seats in the house, so buy your tickets early! Similar to last year, all tickets will be available for purchase online or at the Arts Commons Box office. Due to Arts Commons fire regulations, tickets must be purchased for children under the age of 6, even if they will be sitting on a lap. In order to purchase tickets on the Arts Commons' website, you will have to set up a login name and password. After you enter your credit card information to purchase your tickets, you will be given the option to have your tickets emailed to you, mailed to you (with an additional fee), or pick them up onsite at the Arts Commons Box Office. Please note that if you choose to have the tickets picked up at the Arts Commons Box Office, the person whose name is on the credit card must be the one to pick them up. This can be tricky if it is your card and you are performing in the show! We highly recommend that you choose to have the tickets emailed or mailed to you instead and get them to your guests ahead of time. This will avoid a lot of confusion and inconvenience at the door on show days for your guests.